In June we finally, after 3 long years, signed the purchase agreement for our property. With $250k raised we still need $350k to complete the purchase of the ministry site here in Guatemala. $250k of that needs to be paid by June 4th - Please be in prayer with us for God’s provision. We said goodbye to the Norton family. They left to pursue working in orphan care. We are thankful for the time they served here and wished them well with their new pursuits! They didn’t go far, only about 15 minutes away, and we see them from time to time. Sofia Padilla joined our team as School Director. The year before she was our brilliant math tutor. She is a strong leader and has done an excellent job organizing the school and leading the students and teachers. She is in university pursuing a degree in mathematics. We are happy to have her and love seeing her dedication to the kids and the ministry. 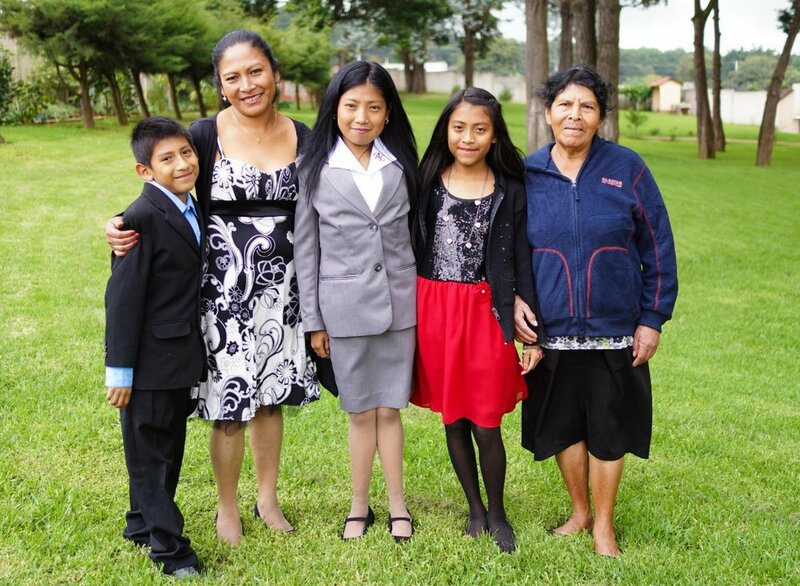 We welcomed 2 new families to the program - Rosa and Elizabeth. Elizabeth has 2 children Brian Miguel and Caty. Rosa has 1 son, Geraldo. Both ladies joined our leather working shop. We started a leather working project. All of last year was spent learning the craft and developing products to export and sell in the US. The ladies have worked hard learning how to sew leather by hand. More details on this project in a few weeks! Nida Padilla joined our team as Women’s Director/Office Manager. She handles all of the secretarial and bookkeeping tasks of the ministry as well as manages all of our employees. She also works directly with the ladies in the ministry by leading daily devotions, 1:1 discipleship, counseling, budgeting and life coaching. She has an excellent rapport with the ladies and bridges the cultural gap for us. We are blessed to have her working with us! 2018 was our second year of operating a school at our ministry site. It was a very successful year for all of our students. All of them came from a public education to our high quality, private education and the transition was not easy. We saw tremendous growth academically and spiritually in our students. The ladies study in the afternoons and have made significant progress as well. We are very proud of each and every student, adult and child alike, and the progress they have made academically! 2018 brought a few changes to our ministry here at Project for Hope but we ended our year well. We saw God working in the hearts of our people and we saw growth, both mentally and spiritually, as a result. Little by little we are starting to see fruit of the labor God is doing through us. We are looking forward to seeing more in 2019! Friday afternoon we brought Jose home from the hospital. In the last three weeks he has made three trips to the operating room. The first two related to cleaning and removing the bad areas of his bedsores. The third was extensive plastic surgery to repair 4 large bedsores and 4 smaller ones. His body is healing well and the doctors have given us the go ahead to move him home. José is pictured here with Dr. Chew. We've been waiting on the final hospital bill (here in Guatemala they add the Dr. charges on the last day of treatment) We're in need of $4000 finish paying the final hospital bill. An additional $2,000 will allow us the buy medicine and supplies (we have an experienced nurse who is volunteering his time to see José daily at no cost) as well as bring a physical therapist daily for one hour to work with his legs and arms for the next 3-4 months. This is an excruciating process for him but very necessary if he's going to have a life outside of his bed in the future. We're praying and reaching out to you all one more time to help us bridge the gap for José and raise the $6000 needed. Donate to Jose's care here, Thank you for your prayers and generosity! I want to thank you all so much for your prayers. Please keep praying for Jose, his recovery is progressing but it’s very difficult. Thursday evening the doctors performed a 3+ hour surgery/skin grafts to cover the area of the bedsores plus 4 other smaller areas. the main skin grafts are large, I was with the doctors this morning when they removed the bandages and everything looks very good. Please continue to pray for his body to heal and for God to encourage his heart. The pain is very intense for him, especially the daily physical therapy. This morning we're asking for prayers for Jose as his doctors have planned to operate in the next few hours. Please pray for a successful surgery, for blood loss to be minimal and wisdom for the surgeons. It's been a tough week for Holly and I. We've had the pleasure of having a great team from Tennessee serving here at PFH but have been heavy hearted about Jose and how best to proceed. At the end of last week, as I was coming to the realization that we were coming to the end of donated funds for Jose's care, we began seeking alternatives. I reached out to a doctor who has been very kind to the ministry and is the head of internal medicine at a smaller national hospital. He agreed to help and garnered support from the head of surgery and hospital administrator to accept Jose for an extended period of time to allow him to heal. A company in Guatemala agreed to allow us to use the wound vac at no cost so we made the decision to move him hoping and praying for the best. The reality is that the national hospital system is overwhelmed, under-funded and under-staffed. The men's floor where Jose was located had two nurses and they were checking on him every 8 hours, instead of turning him every two hours per doctor's orders. He had not been turned once in his four days there. He was having some difficulty breathing (as a result of increased pain) and was hungry. They didn't have sufficient food to offer him adequate meals. When we heard this, we sent a meal but the nurses ordered that it be thrown away because they don't allow outside food. As his health was declining we prayed constantly but were loosing hope. I felt guilty about having transferred him. Though we we're successful in saving his life and getting him stable, we had come to the end of the funding. I admit I think a little too much about things...knowing we needed more funding I debated with myself. How do I ask, again, for Jose when we have so many under our care at PFH with many real needs as well? I called a good friend and I explained our predicament, started explaining all the details of how the hospital had charged us, we went through the money so quickly, and what to do, etc. He stopped me in my tracks and reminded me how amazingly God had shown his love for Jose. How could I think He would abandon us now? Later Tuesday morning, we received a gift for Jose to bridge the gap until we have the needed funds and we were able to get him to a better hospital and the care he desperately needed. Praise God for His faithfulness! 5 months after the accident he finally had a CT scan of his spine and there was no fracture. The extreme pain he is experiencing is a result of severe nerve damage from the electrocution. Yesterday they began physical therapy, gave him a blood transfusion, his labs were within limits to move forward with surgery. Tomorrow they will be operating to perform skin grafts on his burns and bed sores. It will be an intensive operation but the plastic surgeon is confident that this is the best route to accelerate his healing. Yesterday's procedure (2nd surgery) went well to treat Jose's wounds. Everything looked good and they are healing nicely. Praise God! Today Jose is being transferred to the national hospital in Antigua. Our prayers now are protection from infection, attentive medical staff, and continued healing. He is in a very good private hospital but the costs were high due to the amount of very expensive medications needed. We have almost used the money raised for his care in only a week! For him to stay there is not feasible, long-term, so we've prayed and searched the next best option and feel the national hospital is the way for now. This is the absolute least ideal option since the national healthcare system is horrible here and is what failed Jose to begin with but it's the only door God has opened so we will go in faith. We personally know several doctors there and he will be under their care. Chris will be in contact with them daily and advocating for Jose's care. We are still pursuing other options so pray for those doors to be opened if it's His will. Jose's situation is in His hands and we are earnestly seeking Him every step of the way. Jose's family has been with him every day in the hospital. His mom, brother and sister take turns spending the night with him so he won't be alone. They love him obviously but his mom said they go so "He can be loved and see their faces, receive a smile". They will not be able to spend the night with him in the national hospital or visit with him as long each day. Pray for his spirits to not go down, for sadness to not overwhelm him, and to have hope and not despair. Pray for the medical staff to love him and treat him well. We finally had the opportunity to visit with Jose last night and he is still doing great! The red you see in the picture is not blood, it's some sort of wound care solution they are using to treat his burns from the accident 5 months ago. He is smiling here but we can assure you he is in a great deal of pain because he is on his side which means he is being turned. They do that every 2 hours and it's very painful. For a guy who has been through what he has, his attitude is exceptional and he's always got a smile on his face. They are using a wound vac for the three areas. On Friday he will go back to surgery to see how the bed sores are healing. This will happen every 6-7 days while needed. Please pray for them to heal quickly so he doesn't have to go to surgery every week for very long. Pray for his pain, when it's intense he's not eating as much and the nutrition is a key component of his healing. He asked me for something to read and is listening to the audio bible we brought him. Pray also that the Lord would give him peace and encourage his heart. We will post another update on Friday. We just received a call from the surgeon and Jose is doing very well. He’s smiling asking to eat and eating well! His wounds and the colostomy look very good. We’ll keep you updated. Thank you so much for your prayers! There are times when you are floored by God's goodness. This is one of those times! At 7:16am this morning we received the first donation for Jose. At 8:16am after several donations and emails we received the final donation that met this need. 1 hour, $10k+. We're grateful for His faithful provision for Jose. Please keep praying for Jose and we'll be posting updates on the blog at Project For Hope. I'm reaching out with an urgent need, asking the Lord to save the life of a young man here in Magdalena. Tonight we need your prayers and some generous financial assistance. I met 19 year-old Jose and his mother Maria on Tuesday afternoon. It was obvious he had been badly burned and was malnourished. Maria explained that five months ago Jose had been working with a contractor in the city running some aerial cable. Young people here are so desperate for work they'll do about anything.. including dangerous cable work with no training to earn $5-$10 a day. There was an accident and he was electrocuted and severely burned. The contractor met her at the hospital gave her Q1500 ($200) and told her that Jose had burned his hands and was receiving treatment. That was the last time she saw the contractor and has no way of finding out who he was. After spending three months in the public hospital Maria feared she was losing Jose as his conditioned worsened and he had developed bedsores. (Public hospitals here are understaffed and notoriously underfunded.. commonly not having medicines or basic supplies) She mortgaged her small home and put him in a very low scale private hospital hoping his situation would improve. Last week the money ran out and Jose was sent home to die. I was totally unprepared for the sight of the bed sores this young man had developed due to lack of care. Honestly the most horrible thing I have seen in our almost seven years here in Guatemala. We realize that there are no guarantees in this situation, it's highly complicated. His life is in God's hands - please join us in prayer for Jose. On Monday we got a call from a local friend asking if we'd go visit his neighbor. The information was vague but it was someone in medical need. Chris met up with Mincho on Tuesday and he led the way to his neighbor's house. Let me stop and say that in our almost 7 years here, we've seen some pretty horrible things but nothing has even come close to what we saw of Jose. He's a 19 year old kid bedridden with horrific bedsores and burns, slowly dying. His mom, Maria, explained that five months ago in July, Jose had been working with a contractor in the city running some aerial cable. Young people here are so desperate for work they'll do just about anything, including dangerous cable work with no training to earn $5-$10 a day. He was working to help support his family and save to begin high school in January. There was an accident and he was electrocuted and severely burned. The contractor met her at the hospital, gave her Q1500 ($200) and told her that Jose had burned his hands and was receiving treatment. That was the last time she saw the contractor and has no way of finding out who he was. Her son was being treated for burns on his hands but also on what appears to be 50% of his body, if not more. $200 really can't do anything for that. He was treated at the national hospital which is a step or two up from the worst care anyone could receive in Guatemala. Public hospitals here are understaffed and notoriously underfunded, commonly not having medicines or basic supplies. When the accident happened, he was on a telephone pole and fell 20 feet to the ground and landed on his back. He has some sort of spinal injury that has left him unable to walk. This injury was never even looked at when he was hospitalized. After spending three months in the public hospital, Maria feared she was losing Jose as his conditioned worsened and he had developed bedsores. She mortgaged her small home and put him in a very low scale "private hospital" hoping his situation would improve. Last week the money ran out and Jose was sent home to die and four days later we met him. We are passionate about education and believe it's one of the integral keys in helping to break the cycle of poverty. Through God's provision, Project For Hope launched our Education Center for the women and kids in our program. Classes started in January and things are going very well! Late last year we received some very generous donations and were able to get the center up and running - computers, desks, furniture, roof repairs, painting, etc. In the mornings the families come in together. Moms go to work and the kids go to school. They meet up again at lunch time and after, the moms go to school and the kids have activities in the afternoons like PE, bible lessons and art. Some of our ladies are starting or continuing their elementary education and some are working on middle school. Last year all schooling was off-site so it's great to have everyone together in one place. This gives us as much time we need to pour into their lives. Our verse for the center is Philippians 3:14 " I press on toward the goal to win the prize for which God has called me heavenward in Christ Jesus." Inside each classroom is Philippians 4:13 "I can do all things through Christ who gives me strength." Getting their education will not come easy for any of these ladies and kids. So each day when they come in, they'll need to be reminded that anything is possible and they can do it! Carl and Lisa are the Directors of the center and work with the kids and teachers. Janet and Isabel were with us last year. Janet is the preschool and art teacher and Isabel is in charge of the curriculum as well as teaches the 4th - 6th grade group. Lesly teachers the Kindergarten - 3rd grade group and the moms in the afternoons. Her dad is the pastor of a local church here in Magdalena and she is going to university on the weekends. Elizabeth teaches the middle school group and some afternoon activities. Many of you know our friends Cesar and Andrea. Elizabeth is their oldest daughter. She just began studying the university this past weekend. These girls are super creative and made all the teaching aids that are on the walls in their classrooms. We are blessed to have a great team of teachers! Last year the kids attended a local private school. It's been on our hearts since before the beginning to have them educated here where we can pour God's love into them, encourage them and do all we can to help them succeed. We've only been at a few weeks and almost immediately, we've seen the impact this environment has had on their attitudes and ability to learn and do well. One girl in particular, Glendy, did not do well last year and we anticipated this year being a struggle because she honestly does not want to be in school. So far, she is working hard, doing great academically, and enjoying school! As always, it's a privilege to be part of all God is doing here at Project for Hope. Check out some pictures in the gallery below. Project for Hope has officially begun! What was once a thought, then a dream, then a purpose, is now a reality and happening right before our eyes. We've prayed and planned and seen it all come together. Through God's provision we've welcomed 8 women and their children, 17 kids in total, into the project. The ladies are currently in Phase 1 where they are receiving job training, budget counseling, daily encouragement and most are attending literacy classes. We have 2 ladies enrolled in a Saturday program where they will receive their middle school diploma. On top of all that, they are working here on the property, Monday through Friday - cleaning, cooking, and maintaining the grounds. Eventually, they will be working in the greenhouses when that phase is up and running. They are happy to be here and it's been amazing to see the changes in their demeanor that having hope brings. Simply not having to worry about food on a daily basis is a huge burden that has been lifted for most of these women. However, this is the most difficult part of our program and has been overwhelming for them. Going to a job every day, learning about money and budgeting and planning are concepts that are not in their realm of thinking so it's a challenge to take it all in. It will take awhile for it all to make sense and be something they can do on their own. They are troopers though, and willing to learn! As for those 17 kids, 15 of them are in a local private school and 2 of them are in preschool/daycare here on the campus. The kids are being well educated and cared for throughout the day which is another burden lifted from their moms. We are praying for big changes in these families and are excited to see how God works in their lives! We don't have water access which is a problem. Currently we have to buy it by the truck load, which is not cheap. This is simply water for our families to live here and to function - clean, shower, flush toilets, etc. We knew there was a well that was abandoned long ago because it no longer "worked". From what we could gather the previous owners invested $60,000 to drill this well but it was used less than a year because the production was not sufficient for the amount of children that lived here during that time. We decided to get the abandoned well checked out and prayed it wasn't dried up. The guys came, brought up 1,000 feet of pipe and the pump. The pump was ruined after sitting without use for nine years. They sent cameras down and saw water and also saw that the well needed to be cleaned from years of build-up. After 10 hours of cleaning they began to pump - Yay water! It looks like this well will yield 5-600 gallons daily, enough water for our families, visitors and the day to day functions for now. It will be another thing once we have 20 women working, their kids going to school, and greenhouses functioning but for now, we'll take what we've got! The cost of the work performed with the new pump and controls was about $2100. If you would like to help us with this cost please visit our general donation page here. Once we got on the property we felt we needed to get started right away with employing the women our hearts are burdened for. The first two ladies we hired were Noelia and Amelia. They work part-time gardening and cleaning, which there is plenty of. They will never work themselves out of a job! Both ladies are hard workers and so far, nothing is beyond them including handling a weed eater. These women were desperate before but now, they have a small,steady income and it makes all the difference to them and their kids. At first, they were a little unsure but with each day, they are more and more confident in their work. And it shows! Their faces are happy and you can see hope in their eyes. On April 15th our offer was accepted during the conference call with CH. I sent out an email to my board and copied Vic, our pastor, on it. I shared that the property, along with improvements and the greenhouse investment , would bring us to $1.2m needed to launch the project. He shared with me later that he was thinking "That's alot of money - we'll see what God does." On April 16th Vic received an email that shocked us all. I probably need to back up here and give a little of a very long back story. In 2009 we were part of a small, start-up church that met in a living room and then whatever community clubhouse that would let us use their facility. Within a few months God provided a completed sanctuary where we spent a few years. As the church was outgrowing this space, we were looking for a new location. This is where Guatemala intersected our lives and ruined us all forever. Through a series of God inspired events, we took the lions share of our savings as a church, that we had intended to use to get us into a new building, and dedicated it to building homes for desperately poor families in Guatemala. The project became known as the 12x12 Love Project which has constructed homes for almost 200 families to date. Within a few short months God provided the new location: A hip-hop bar whose owners had just been evicted. White leather couches lined the walls, cold beer still in the coolers at the bar. It was a sight none of us will ever forget. A few local business guys had heard what we were doing and invited Vic to lunch. I came along as I was helping with benevolence at the time. After listening to us share how God was doing great things in Guatemala and how He provided a new location, they handed us a check for $25k and told us another $50k was on it's way. The new church was built out, all 11,000 square feet without a capital campaign or asking for money. Another $70k or so came in from a couple of different places and the church was complete. Within a few months of the completion, our family was on our way to Guatemala but that's another story. We had been on the ground here in Guatemala for 3 years when the church had again outgrown it's newer facility. The leadership had been looking for another building; seeking God but unsure what the next steps were. A phone call and a meeting changed everything. A local pastor had been watching, from a distance, the work the church had been doing. Feeling it was time for his exit from his own ministry, he felt God impress on him to give his church and property to our church; 15 acres and a church, free and clear. The church has been recently remodeled and several months ago, the leadership decided to sell off a parcel of commercial frontage. They also decided to commit half of the proceeds to missions and a portion to Project For Hope. We had no idea about the proceeds, just had heard that the property was up for sale. The previous church had tried to sell it with no success. It had been up for sale for over six months when April 15th arrived, without so much as a phone call or inquiry. On April 16th, Vic woke up to an offer on the property. The buyers were interested in another parcel as well and a contract was signed at twice the asking price! The day after our offer was accepted by CH, we tentatively had half of what we needed to pay-off the property. Bam - just like that! Several weeks later, friends of friends heard about what we were doing and were in Guatemala visiting another ministry. They asked if they could see the future ministry site. We met for an hour, shared our vision to train and employ single moms and widows. Then they left and we weren't sure what to think, but we enjoyed meeting them and sharing the story. Again, God was working and, a week later, they let us know that they were giving $350k to fund the complete greenhouse project. Bam-just like that, again! Not long after, there was another $50k and then another $50k. Bam - bam! I'm not sure if I mentioned that we had not launched the ministry at this point. In August, just a month ago, we finally signed the first legal document and took possession of the property. It's been a trying month.. lots of emergency repairs and improvements. The bank account is a little low but we've seen miracles. He didn't bring us this far not to finished what He started. And so, here we are, launching Project For Hope. We've seen God provide over $750k without so much as a letter being sent out. He is good - and we can't wait to see where the next $450k comes from. Stay tuned for Part 4! We visited the property several times in the following weeks and learned that it was actually owned by a large non-profit based in New York City called Covenant House. CH is known for their work with homeless teens all over the US and Central America. The property had served as a home and rehabilitation center for those struggling with addictions and, most recently, a complete program for girls rescued from human trafficking. 5 years ago the program was relocated to Guatemala City for various logistical reasons and the property has been empty ever since. In doing some basic research on CH and thinking through how best we could approach them, we noticed that a member of their board had the same title, in the same company as a friend of the ministry. Both were executive positions and we reached out to our friend to see if the board member was known to him. He didn't know him but agreed to reach out and within a few weeks there had been a few meetings. Within a few months there was a meeting at CH with the CEO and Sr. VP of Central America. Not long after, we made an offer but it fell short. In January of this year we made contact again and were able to arrange for a meeting here in Guatemala. In early March we toured their facility and they came to Magdalena and took a brief tour of the ministries here. On a side note, while visiting their program for girls rescued from human trafficking, known as "La Alianza", we were deeply touched by their work and began to think about how Project For Hope could assist some of these girls one day. Many were young single mothers with nowhere to go once they finish the 3-4 year program. By mid-March we had made a follow-up offer. 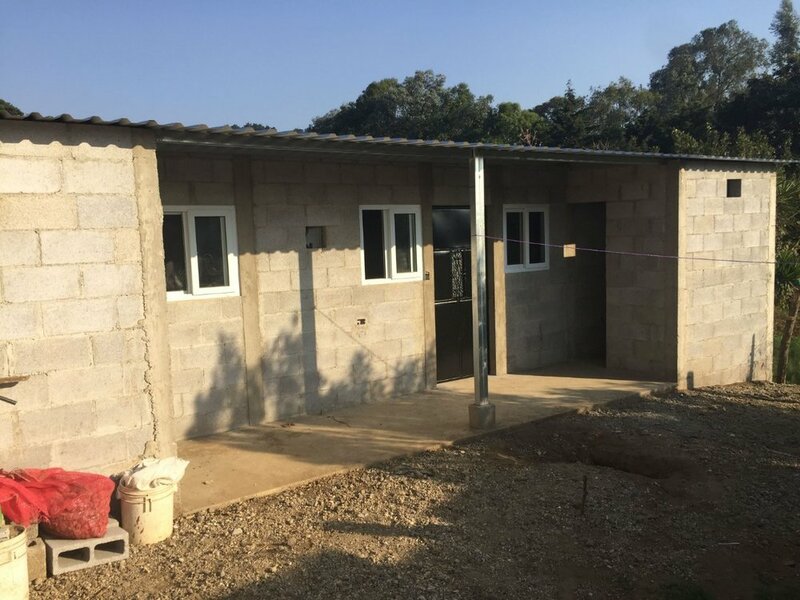 We explained that we did not have the funds but were stepping out in faith, believing for God's provision; that this was His project and we believed He would provide. The only thing we could offer was a small down payment and a timeframe to complete the payment in full. Finally, on April 15th, we had a conference call and our offer was accepted! We were excited and scared to death all at the same time, asking ourselves "What did we just do and how are we going to come up with $700,000!?!" After most giant leaps of faith, doubt creeps in and you wonder if you got it wrong and are going to fall. Well God was quick to answer. The very next day, a little less than half of what we needed was committed. We were blown away! This story spans almost three years. When the seed was planted in our hearts we had one goal: employ single mothers and widows so they could provide for their families. The agriculture sector was the most logical based on the demographics of our area. In the first 18 months we tried, on several occasions, to negotiate agreements to acquire or lease property to get the project off the ground. All attempts failed for one reason or another. We found ourselves frustrated wondering if this crazy dream would ever come to fruition. In retrospect we're so thankful that each attempt fell through... our vision was way to small. Our faith was way too small. Eighteen months ago a conversation with friends brought us to a crossroad. Did we believe that the vision was God's or ours? If it was God's, why didn't we believe that he would provide? The only properties that met our needs were huge and all had asking prices in excess of $1m USD. We had never done any serious investigation on any of them because conventional wisdom told us that was just plain crazy. We've had front row seats to miracle after miracle as partner ministries launched and were funded and built. For some reason we could believe for our friends around us but couldn't quite see it for ourselves. We left that conversation determined to follow the path wherever it took us. After spending a few hours on the internet, we found a property here in Magdalena that was a former orphanage and drug treatment facility. The asking price was in fact $1.1m USD. We made an appointment to see the property having no idea what to expect as it is completely closed, surrounded by a concrete wall. On the street the wall was only a few hundred feet so we had no idea what the size was. On Google Maps it looked like a small property with a couple of buildings. When we entered the property we were amazed at what we found. A huge piece of property with several buildings and a large open field, virtually flat (not really but here in the mountains we call it flat). As we walked around we were stunned. Everything we had dreamed to one day have in the project was already there: houses, a school, soccer field, covered basketball court, commercial kitchen, dining hall, clinic and a huge open field for the greenhouse project. It was as though God built this property just for us! Yesterday we (Nortons & Steeds) visited with Noelia and her family to celebrate the birthdays of Allen (10) and Bryan(7). We brought lunch and a homemade cake and spent a little time with the family. Noelia and I chatted afterward about some of the challenges she is facing right now. We were talking about there being no electricity to her house. She casually mentioned how she was up with one of the kids who was sick recently and found a man trying to get into the thin metal lamina door in front of her house. "It was pitch black, thank God some dogs started barking and the man ran off, I don't know what I would have done" I remembered a night in the past year as well when she had taken an all night job out of desperation and left the kids at home alone. Maria had fallen asleep while burning a candle (their only source of light) and awoke to her bed engulfed in flames. The past few weeks the boys have been really struggling in school. She shared that she's not sure it's worth them being there. There is one teacher for two grades and the current teacher is more interested in being on the computer than watching his class... Allen has failed 3 of his last 4 years and this one is not looking good. So much to balance alone... Pray for her this week.